Nabeel possesses an experience of above 5 years in the field of online marketing. 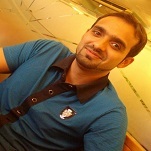 He is a passionate professional currently working for AmerAdnan Associates® as an Online Marketing Associate. Nabeel is responsible for overseeing company’s web presence, social media marketing, and online content marketing.